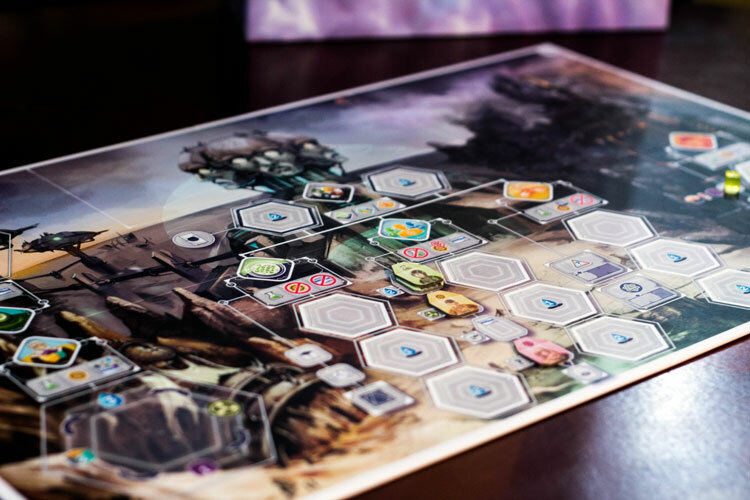 We review Anachrony, the heavy worker placement game what will have you traveling through time and using exosuits in a post-apocalyptic world. If you are a looking for a deep and unique worker placement eurogame, than Anachrony may be for you. Worker placement is somewhat of a tried and true Euro game concept these days. Take your workers, place them on a board to gather resources, and change those resources into victory points somehow. I am, unabashedly, a fan of Euro games. But that doesn’t mean I can’t appreciate awesome looking miniatures and Anachrony certainly has those. But a game can’t survive on miniatures alone. There are some unique twists to resource gathering and how workers can be used that offers a bit of a new feel to the standard worker placement genre. But is it any fun to play? 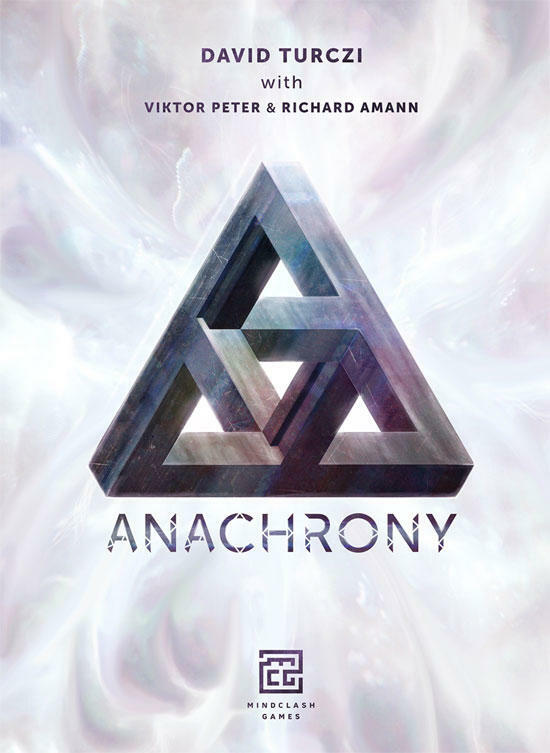 Anachrony is a worker placement game for 2-4 players that plays in about 120 minutes. While the story is somewhat convoluted, the mechanisms in Anachrony rely heavily on the idea that most of the area cannot be accessed without Exosuits, and resources can be sent through time. Most of the worker placement spots in Anachrony are on the main board and can only be activated by a worker in an Exosuit. Each player has 6 Exosuits at their disposal and chooses each round how many to power up, but powering more suits will require more resources. Workers slide into Exosuits to explore the Capital. With the optional Exosuit Commander pack, these suits are wonderfully sculpted minis that have a slot to actually place the worker tile into. They look great and make the game really stand out. There is one production concern I have, and that is the color of the resource cubes. They are grey, purple, green, and yellow, but mostly transparent. It can be nearly impossible to tell them apart from even a short distance away. At the start of each round, you can request resources from the future and they become immediately available to you. It allows you to get a resource that may not otherwise be available that round, but you also have to travel back in time later to pay it back or risk opening an anomaly in time (losing points). Not only do you get temporary influx of resources, but you will score additional points by taking advantage of the ability to travel through time. Besides having Exosuits to deal with, there are also different types of workers: scientists, engineers, administrators, and geniuses. Each has strengths and weaknesses, except geniuses which can take the place of any type of worker. Some worker placement areas require a specific worker, you can’t make a scientific breakthrough without a scientist, for instance. Others give you a bonus; if you mine with an engineer, they don’t become exhausted. Each path has asymmetric options and scoring. Workers in Exosuits can gather water, mine resources, discover scientific breakthroughs, recruit more workers, and construct buildings and super projects. There are four types of buildings and they will create actions available only to you. These allow you to travel back in time, gain victory points or gather resources. And since you don’t have to venture out to the Capital, they can be done by workers without an Exosuit. The game is played over at least 5 and no more than 7 rounds. After the 4th round, the impact happens and a new worker placement area opens up allowing players to evacuate from the Capital. Each player has a different requirement for evacuation, but if you have prepared well for the impact, you can score a significant number of points through this action. Each of the actions on the main board become more powerful after the Impact, but are only available one more time for the rest of the game. Once all of the main board actions have been used, or after the 7th round, the game ends. Players score points throughout the game, but they add the VPs from buildings, time travel, and morale to get their total score. Any anomalies that didn’t get dealt with will be subtracted and the player with the most points is the winner. The Capital worker placement spots are available to all players but require an Exosuit. Worker placement is one of my favorite game mechanisms and I love how Anachrony adds a few new layers to this traditional Euro game concept. Having different types of workers is uncommon on its own, but then the need for Exosuits to activate the locations shared by all players adds a different resource management element on top. The time travel element is interesting, but is ultimately the least exciting part of the game. While getting a resource from the time warp can help accelerate what you are trying to do, you aren’t getting huge rewards this way. It kind of feels like you’ve discovered time travel and all you got out of it was a bottle of water or a chunk of Titanium. However, it is a worthwhile strategy to take things from the warp even if you don’t need them, just so you can pay them back on a future turn. You earn a lot of points for successfully paying back your future self. You can request resources from the time warp. 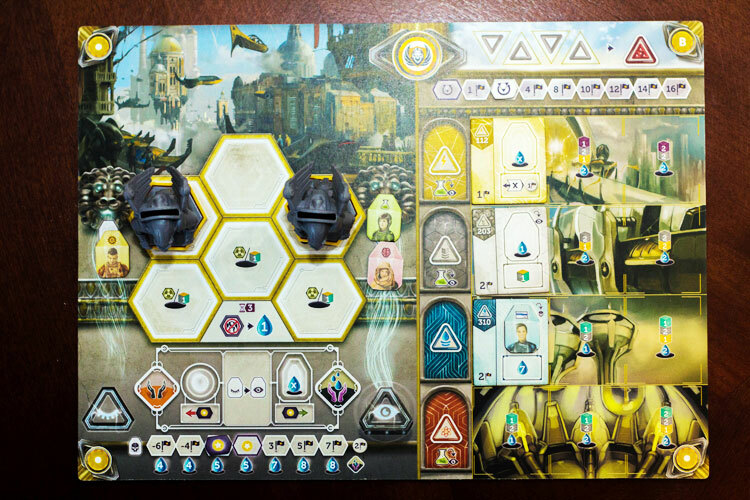 More so than most worker placement games, Anachrony rewards advanced planning. At the start of your turn you are trying to figure out how many Exosuits you need and if you should get goods from the future. It can be a very difficult thing to determine, but nothing feels worse than paying precious resources to power up all your Exosuits but then not having enough workers to put in them. It can slow the game down a bit, especially with AP-prone players. The downside, of course, is worker placement spots are limited and can really ruin your day if you are blocked from where you’ve planned to go. There are two spots on the main board that can be used to activate a spot that is already full, so it is somewhat difficult to be totally cut off, but it is possible. When you plan your entire turn in advance and know exactly what you need to do and in what order only to have someone get in your way, it can be rage inducing. The game builds up nicely though. During the first turn, you have only a few workers and only need a couple of Exosuits. But as you construct buildings in your own area and recruit more workers, subsequent turns start to feel really powerful. It is incredibly rewarding to have buildings of your own to activate and have to rely on Exosuits and battling other players to make progress throughout the game. It does actually give a feeling of developing your own “safe” and productive area in a world crippled by some disaster. Each path has two leaders that give you an additional ability. There is quite a bit in the box to keep each game feeling a little different. Each player board is double-sided. The A sides are identical for all factions, but if you play with the B side each faction has its own strengths and weaknesses. 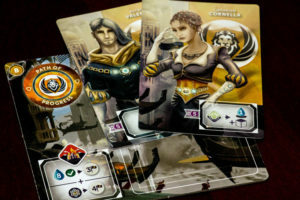 Additionally, each faction has two leader cards that you will choose during setup that gives you a special ability. So in essence there are 4 different setups for each faction available. There are also asset cards that can be used to draft your starting resources at the beginning of the game rather than just using the suggested items. Also, Anachrony includes a Doomsday mini-expansion that can be included that adds a couple new rules and can change when, and if, the impact ever happens. This adds experiments that can be completed throughout the game and can change how points are scored rather dramatically. 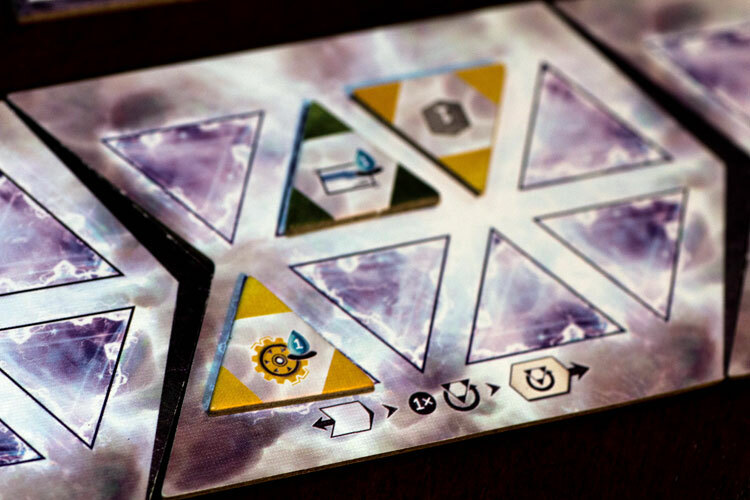 Anachrony is a must play for anyone who is a fan of worker placement games. It is undeniably worker placement but feels different in a way that I don’t have anything quite like it in my collection. The production is good, obviously the miniatures are fantastic. But from box to cardboard pieces, the game looks great outside of the issue with resource cubes. For as flashy as the production is, Anachrony is all about small incremental steps. You build up resources so you can eventually construct buildings. Those buildings may give you additional workers or resources so you can finish super projects. Before you know it you have built your own engine that can run itself without venturing to the Capital. The need for planning ahead may not appeal to everyone. There are certainly folks in my group who have a tendency to over think every move who I might avoid introducing this game to. 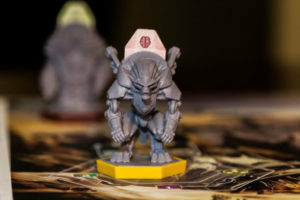 But I have enjoyed all of my plays of Anachrony and with all of the variety in the box, I can continue to explore new paths and leaders that I haven’t played. Final Score: 4 Stars – A well produced take on worker placement with a unique feel and a ton of variety. The time travel bit really got me hooked. Are there any other games you’ve played that have a very strong time travel mechanic? I’ve had a couple ideas but haven’t ever tested them out.